Image sublimated to masonite with easel back or kickstand for easy table top display. Your artwork or photo sublimated/infused to the surface of a masonite panel with it's own easel or kickstand backing. Your finished print will show incredible detail and color. Perfect for table tops, desk and bedside displays. Recommended Image Dimensions: 10 x 10"
Hardboard Art and Photo Panel with Easel, 10" x 10" x .25", White Gloss with a lush, thick sublimation coating. Great art presentation. 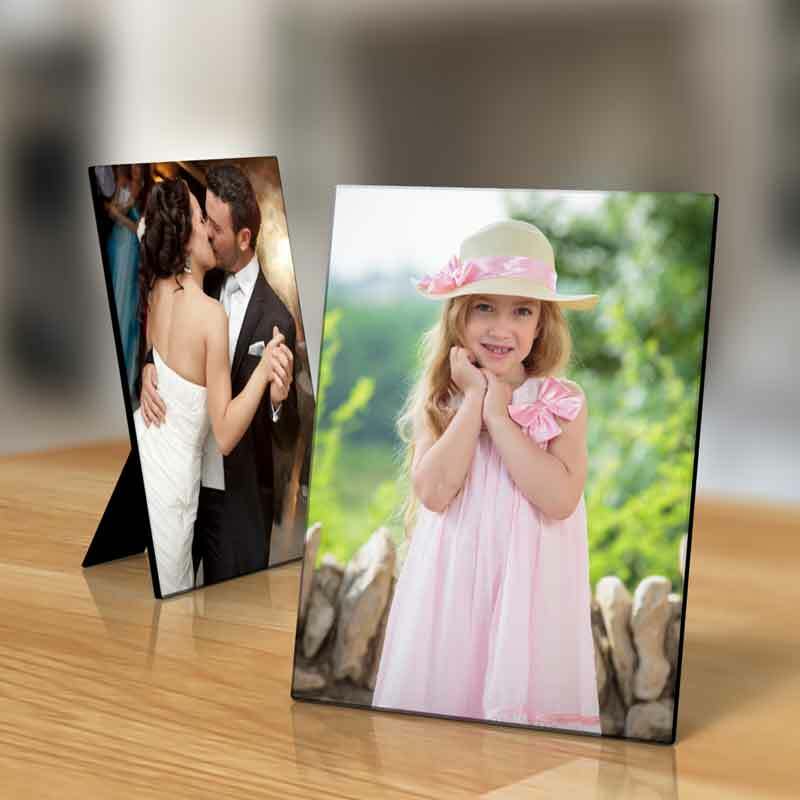 Hardboard Art and Photo Panel with easel, Square, Flat Top, White Gloss Sublimation Ready, 6" x 6" x .25". These are luxurious panels, they make every Art and Photo pop out. Hardboard Art and Photo Panel, 8" x 10" x .25", White Gloss Arch Top, with Easel. Extraordinary Sublimation panel displays your artwork like Picasso never dreamed! Hardboard Art and Photo Panel, 8" x 10" x .25", White Gloss Sublimation Coated, with Easel. Offer your customers this eye-popping choice for their Art and Photos. Hardboard Art and Photo Panel, 5" x 7" x .25", White Gloss with an Arch Top, with Easel. Sublimation coating with HD details makes one of a kind collectible artwork out of family Art and Photos, you add the art! Hardboard Gloss White Art and Photo Panel, 5" x 7" x .25", Flat top, with Easel. Excellent thick sublimation coating produces incredible results, imprint your customers Art and Photo on this panel and watch their eyes, they will be amazed at the detail and beauty. 10x10 Hardboard Art and Photo Panel with Kickstand Easel. Semi-Gloss White Sublimation Hardboard. 10" x 10" x .25". Home decor has never been more imaginative. 6x6 Hardboard Art and Photo Panel with Kickstand Easel. Semi-Gloss White Sublimation Hardboard. 6" x 6" x .25". Home decor has never been more imaginative. 8x10 Hardboard Art and Photo Panel with Kickstand Easel. Semi-Gloss White Sublimation Hardboard. 8" x 10" x .25". Home decor has never been more imaginative. 5x7 Hardboard Art and Photo Panel with Kickstand Easel. Semi-Gloss White Sublimation Hardboard. 5" x 7" x .25". Home decor has never been more imaginative.